Larry writes "Toy genius A.C. Gilbert gave motion to his models in several ways. 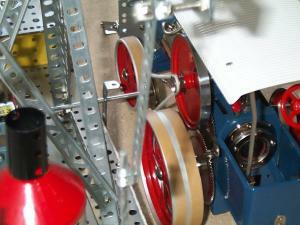 These included cranks, wind-up motors, small battery-powered motors and powerful electric motors, some with gearboxes. 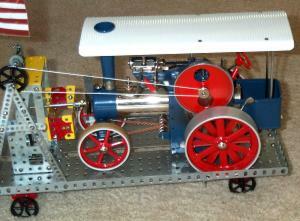 I've always loved my Erector sets, but I also have a fondness for toy steam engines. 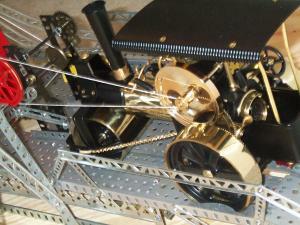 Using my small steam engines to power the Erector models never even occurred to me until about 2 years ago. My first attempt to combine the two toys was with a truck that I'd built. After some modifications and guesswork, I managed to drive the truck with the same steam engine that was mounted and secured in its bed. 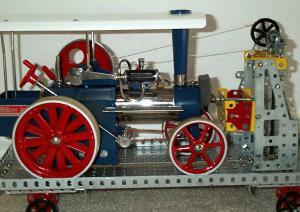 I was elated and since then I've powered many Erector models with different types of steam engines. Some attempts were successful and some were not. I'd like to briefly share the lessons I've learned to anyone interested in trying something a little different. There are two basic types of steam engines; those that are stationary and those that move under their own power. The type of engine to use depends mostly on the model's complexity, it's size and, if mobile, it's weight. The larger toy steam engines can deliver approximately the same shaft-torque, or shaft horsepower, as the A49 electric motor, when ran at a "full head" of steam pressure and at full throttle. These engines turn their flywheels at a very high RPM, so it is usually necessary to use reduction gearing or pulley combinations to get the desired axle speed. 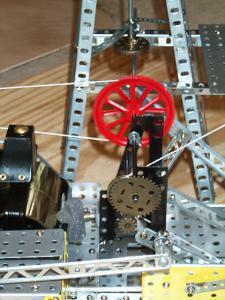 If the model is free spinning and light, then the steam engine's throttle is best to control the speed of it. On some models I just ran a longer axle from the electric motor and, with its gearbox in Neutral, powered the model through the same drive mechanism. 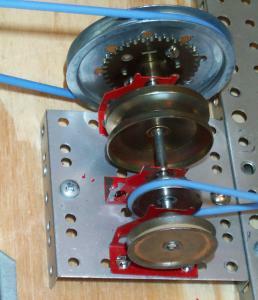 But the combination of both pulley and gear ratios is usually necessary, especially if the model is mobile. In all instances it is best to install the electric motor first to test and adjust the model before attaching the steam engine. I hope these photos are helpful to show you just a few designs and applications that I've used for reduction gearing, pulley applications, etc. My drive belts are usually heavy string, but sometimes I have to use flexible spring like cables, O-Rings from the hardware store and even some leather belts. Sometimes I have to "push" or assist a large, heavy model to get it going, especially when the steam engine can't power it from a dead start. Such was the case of my steam-powered locomotive. (See it in operation in Doc's Model Gallery.) That model was just at the limit of the tractor's ability. (The larger, more-powerful stationary engines could have propelled it better, but they are simply too big for this size train.) The train would not run on the carpet (too much drag) and the wheels would just spin on the tile floor because of the weight of the whole thing. Running on the sidewalk was close, but it did chug along nicely until it came to an incline or a patch of uneven pavement. By the way, in that application, I ran the steam tractor's throttle at full power and reduced the final axle speed through one set of pulleys and two sets of P12 and P13 gear combinations. Whether Dry Fuel tablet or electrically heated, these engines run very hot! Children should be supervised very closely to prevent serious burns. Always use distilled water. Always! Oil the engine as directed. Heat the (distilled) water to near boiling in the microwave first. This will let you use less fuel tablets and the steam pressure comes to a head more quickly, allowing for longer runs. Needle-nosed pliers with rubber or plastic tip covers are best to use for adjusting and controlling the steam engine when it is operating. Trust me, far less burned fingers this way. These engines produce and spew super-heated steam. The Erector pieces are made of iron. You know what that combination means, rust! Always try to avoid water puddles on the Erector pieces. Dry all the pieces and the steam engine with a cloth towel as soon as possible after running. These engines exhaust through the smoke stack and from the piston assemblies vents. Always place the engines so that the smoke stack is clear. Stationary engine's exhaust should be vented overboard, or into a small jar, through plastic or rubber tubing. All models should as free spinning and as balanced as possible. Oil all points where friction occurs, including the linkages, axles, gears, etc. 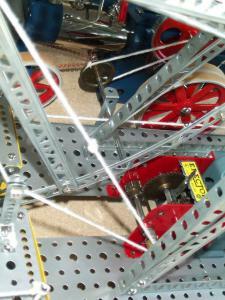 Try to install the Erector motor first and use it to adjust and test the models before attaching the steam engine. The typical dry fuel tablet steam engine should give you 3-5 minutes operation before it "runs out of steam". You'll usually get two runs on each boiler of water. The unique odor of the burning dry fuel tablets will dissipate shortly. Your wife shouldn't get too upset. There are several manufacturers of these engines such as Wilesco, Mamod, Jensen and Weeden, just to name a few. Although I am a Wilesco fan, I'll admit that any make or model of a toy steam engine could be used providing that model produces enough power. I can furnish links to any of these company's sites to anyone who asks. Miniature steam engines are not terribly expensive, but then again, they don't give them away either. The price range for an appropriate size engine for Erector use should be about $125.00 - $200.00. Of course more powerful and more expensive ones are available, just as with any hobby. I am not trying to take any glory from the time-tested and well-proven Erector engines. It's just that these miniature steam engines can be just as much fun to "fire up" and bring life to your Erector creations. And can be very satisfying for big kids like myself. Besides, for that nostalgic thrill, nothing quite matches the sound of a real steam whistle. Chugs and Hisses to all!